A Work In Progress: One Middle-Aged Broad's Descent Back Into Horse Madness! : Show-apalooza! If you read my last post, you know my kids were getting ready for a show and making me bat-crap crazy, bless their hearts. There were more than a few moments that I doubted we'd ever make it to the show. However, we did make it to the show.Sugar and James were on the trailer chowing down on their hay, completely unfazed by the horse show atmosphere. Not surprising, as nothing gets between The Sainted Mare and her food, and James is smart enough to know that if he snoozes he loses! I'm a fair weather horse show-er. My feeling on this is that I pay too darn much to not enjoy myself, and showing in the rain ain't my idea of fun, you know? I suppose that'd be different if I were good, or qualifying for something, but I'm not, so I can be picky. 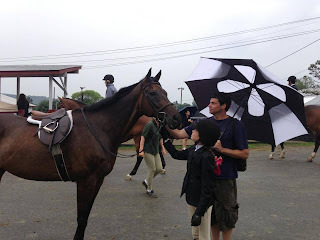 However, it was the spawn's horse show, and I didn't want to disappoint them. It wasn't even really raining, just seriously threatening. Until we got there, of course. Then the rain came, just in time for Sophie's division. Long story short -- the Child rode pretty well. Since she'd fallen off at the last show, my trainer decided to drop her down a division and work on the basics and the issues she felt contributed to the fall. I have to say I appreciated that tremendously- it's the first time I've had a trainer say "Hey, there's an issue here. We haven't addressed it properly to date and it's causing a problem now and will cause more later, so let's take a step back." Soph worked hard to keep her heels down and to keep from jumping ahead. They had some really nice moments, and a few "learning" moments. It was her worst round that I am most proud of. Things were going so well, and then she moved up a bit too much down a line and he landed the out of the line feeling a bit frisky. He started sassing; shaking his head, bucking a bit and being naughty. Instead of going fetal, as she might have a year or two ago, Sophie calmly circled James and got him back under control, then quietly finished the course. Despite that round and a few other errors, Soph wound up as champion for her division. The ribbon was nice, but if asked, I think she'd tell you she was more proud of the way she handled things when they got challenging. Noah was showing Sug, which was a first. Was Mom nervous? Umm, YES!!! Not because I was worried Sug would be naughty, but well, just because one of my babies was riding my 4-legged baby. Also, Madame Mare may be lazy as heck at home, but she knows when she's at a show, and rises to the occasion, as my trainer soon found out. Sug schooled like she does at home: she la-di-da-ed around the course looking like she was about to drop into a coma. However, the lackadaisical manner was dropped as soon as she entered the ring for the class. Ears pricked, she thundered down the first line, and when the Boy cut the turn after the diagonal, TSM clearly said, "Right, jump off! Game on!" Didn't matter that it was a 2' course. My trainer reached out, grabbed my arm, and turned to me when it was over, saying, "Ok, clearly we are doing Itty Bitty jumpers next time!" Despite the fact that Sug's pace was not particularly, ahem, hunter-like, she and Noah also were champions for their division. More importantly, they had a blast together. All in all, it was a good day. We spent time together as a family, had fun with our ponies, and the kids got some good horse show mileage under their belts. Definitely worth the, uh, aggravation of the horse show prep from the night before. Good looking horses and spiffy looking kids! :D Congrats to them on a successful show, all the bat-crap crazy is worth the smiles on their faces and the feelings of success. Lovely photos, glad the kids had fun! Video doesn't work, btw. I had to laugh at the last photo. Looks like hubby got the scariest umbrella he could find. Certainly one of the horse eating variety. Julie, I know! That darn umbrella killed me! And he had no idea! Just wandered all over with it-- thankfully all of the horses were unfazed. As soon as I saw him i told him why it was not a good idea, but by that point he'd been all over with it. LOL. Go Sophie! Calm and cool always wins. Blue ribbons don't make the rider, connecting with and handling your pony does. You obviously have an awesome trainer working with your kids! I hate hanging around to watch the short stirrups kid ride because I see *so many* coaches hanging on the rail acting as though it's totally normal that their tiny 8-year-old student is clinging on for dear life as her mount tears around the hunter course with his head in the air, and then loudly congratulating the kid for staying on when she leaves the ring. Scary stuff. I don't have kids myself yet, but when I do I am going to be on the lookout for a trainer like yours! I'd way rather see a kid drop down a division than start to associate shows with pure terror.